Vacation rental condominium. Sleeps 12, 4 bedrooms, 4 bathrooms. Dogs allowed. St. Croix Penthouse (for 12 people) features four bedrooms and four private baths. The master bedroom has a king bed, one guest bedroom has a king bed, the other two guest bedrooms have two queen beds each for a total of 4 queen beds. There is a living room and dining area. This unit has a fully equipped kitchen including microwave, blender, dishwasher, washer/dryer, and breakfast bar. Living room and one bedroom has sliding glass doors which open onto a private balcony overlooking the water. Other room features are central A/C, ceiling fans, large walk-in closets, cable TV in living room and bedrooms, iron and ironing board, hair dryer, and beach towels. Pelican Landing’s heated swimming pool is surrounded by a sundeck. There is a minimum stay requirement on weekends, during special events and holidays, and during season. One boat slip is included with this Penthouse. Each Penthouse can only accommodate one boat; no exceptions. Trailer parking is not available on property. 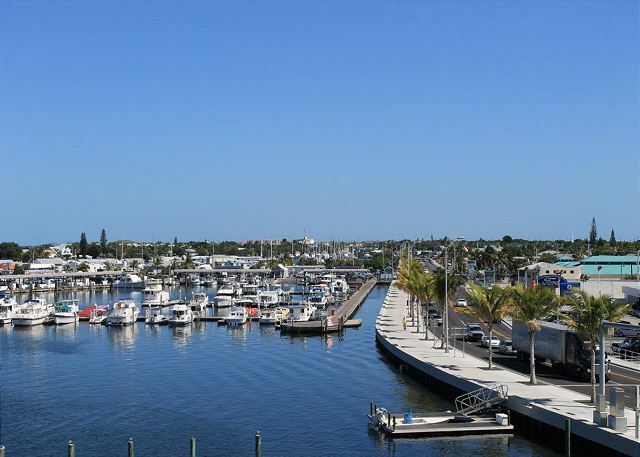 Trailer parking and additional boat slips are available across the harbor at the City of Key West Marina. Please contact the dock master’s office to make arrangements for trailer storage and/or additional boat slips at 305-809-3981. The St Croix unit we stayed in had a great view of the harbor and beautiful sunrise, and a great view to the west of the Key and amazing sunset. The staff on site was warm, helpful, and friendly. Overall The unit was clean and nice, but desperately needs new carpet on the stairs. It is an older building with new appliances and everything we needed included in our stay. We felt safe in the neighborhood and enjoyed a ten minute walk to the free Duvall Loop bus (stop 18). We really loved our stay and would definitely stay there again. My husband & I brought 8 of our best friends to Key West to celebrate my 60th birthday. The Pelican's Landing was home to for us for our stay. We had a blast! We were in Key West for a small family beach wedding. Coming from 2 families, not all of us knew each other, and the condo, with 4 bedrooms and a kitchen, living and dining room, allowed us both privacy and a comfortable place to meet and get acquainted. We especially enjoyed the balcony overlooking the marina and gathered there frequently. Some of us enjoyed the pool as well, especially at night, since the water is quite warm. We sometimes walked to town, sometimes took a car, and sometimes used Uber. All worked well. The neighborhoods between Pelican Landing and Duvall Street are beautiful and interesting to walk through. We sampled many restaurants, because we did not do everything as a group, and without exception found the food to be great -- whether at a little hole in the wall or a nice resort restaurant. We had a good time and were pleased with our accommodations. 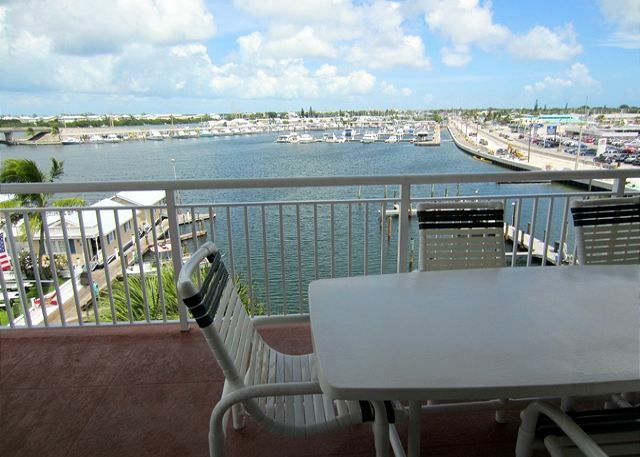 The host was very accomodating, the condo was clean and located close to the marina and not far from the action. The St. Croix penthouse was very large and there was plenty of room for the 7 of us. Views of the marina out back were nice. Pool was clean; warm water. Condo is showing it's age and can use a remodel. Location is pretty good. We walked the 0.9 mi to the Dry Tortugas ferry dock, and our fishing charter picked us up right at the condo dock. Duval St is a bit of a hike; we sometimes used Lyft instead of walking. Overall a great value for our group. Nice location on marina. Property was clean, check in was easy and no major problems with property. Overall property could use some cosmetic updating. Updating needs did not impact our rental as they were more cosmetic in nature. Great staff, very clean property, beautiful views, and close walk to everything. Would stay here again. If you bring a boat to the Key's this is a great place to stay. It was wonderful. Comfortable beds,lots of room and the balcony(porch) is the best part. Rental was spacious and in a convenient part of Key West. Great for boaters due to dock being included. There are some areas for improvements. Some upgrades are needed. New paint. Inside some areas and deck. Mostly ceilings. Some nights the noise level from fire house across the street and police using the road next to building. Next time I would take a room with in wall AC to drown out the outside noise. Overall great building. This unit sleeps 12 so that worked great. The staff at the location were all super helpful and efficient. I look forward to visits in the future. We stayed for five days to attend a friend's wedding. Great location! We had six people and could have done 8 without being crowded. We loved the accommodations and had everything we needed. Location is just over a mile from Mallory square. We rented this property for a group of 12 people and it was the perfect sized space! The view each morning was breath taking. We greatly benefited from the on-site amenities (shared grill, in unit washer and dryer, FULL kitchen). Overall it was a GREAT trip. However I have stayed in this property in the past (10 years ago) and it seems as though there have not been any updates since then. The furnishings and bathrooms could benefit from some upgrading. Additionally the swimming pool was a loss as we saw many birds floating in the water everyday and relieving themselves in the water or alongside the pool where people would sit or walk. In a week's time I only witnessed the pool getting cleaned once. I'm not sure how they would keep the birds away. Also it wasn't until we looked in the kitchen cabinets that there was evidence of a small pest problem that hopefully will be looked into. Overall the space was great, the management staff were helpful and I'd recommend this location to others with the disclaimers I had mentioned above. Condo was nice. Some of the bedding and decorations were dated. Ceiling could certainly use paint job. Location was great, views were phenomenal. Fun short week for Thanksgiving celebration. Great for large families. However, holding keys hostage made for very difficult initial 2 nights. Very satisfied! The unit was very well equipped to prepare meals at the penthouse, parking was never an issue even though we were advised by management staff it might be. Close enough to Duval to see and experience the activities there. Beautiful water views and was presented exactly as the photos. Overall would give the condo a rating of 3. Unit needs a deep cleaning and painting. Washer/dryer combo does not function properly and ceiling fan in great room needs replaced with larger fan with more blades to "move some air"
Every year since 1992 our group of anglers from all over the UK fish for two weeks in Key West. Since we discovered Pelican Landing 10 or more years ago, we've stayed nowhere else. And why would we? It is the perfect location for our needs. Spacious, comfortable and a home from home. Enjoyed the decks, the pool, the grill, the stairs, the location (go eat tacos with a 24oz PBR at Mellow Ventures). A relaxing 25 min walk to the pulse of town - we also rented a few bikes. Plenty of bed and bathroom space for eight of us. A fine find on the island! Our daughter got married and we needed a big enough place for the whole family! The Pelican Landing was big enough! The air conditioner worked great and the pool was fantastic! The place needs a few updates but you only sleep and shower there so it was wonderful for that!! I'd stay there again cuz it wasn't right on the beating path and it was great for kids! Don't try and check in early cuz they aren't friendly with that! A group of 4 couples went down to Key West for my Husbands 50th birthday celebration. We found everything about Pelican Landing to be perfect! It is about 1 mile from Duval St activities. It is also very close to a supermarket and other supplies. The unit was large with more than enough room for us. We really appreciated the availability of separate bathrooms etc. and all the shared living space. We saved a fortune over staying in a hotel of equal quality. It was clean and the people were great to deal with! Thanks so much! Great place to stay for a large group. Awesome views, easy to get to everything. Could use a few upgrades in the kitchen. But clean and functional. We would definitely stay again. Unit was clean and accommodating for our guy trip in February 2016. Dock and waterfront on rear of property was peaceful and convenient, the boat captain picked us up on the dock one morning and brought us back that afternoon. Staff was excellent and no problems. The unit was what we expected for the price and location to Duval Street. Close to all spots if your coming to get out and adventure all the local spots. Very Good. The water pressure was low on 2 occasions. and one of the sink had a slow drain. The unit was clean and spacious. Beds were comfortable. Loved the deck overlooking the marina. The pool was clean and heated. Convenient to Duval Street. Parking out front. Office staff was friendly and helpful. Would highly recommend this condo. 6 of us stayed in the property, and we had enough common space to invite others from our large group over for meals and poker night. Great property, clean, comfortable, everything worked as expected. Would stay again. I booked this condo for my daughter and her bridesmaids to get enjoy during the weekend of wedding festivities. It was perfect, large enough to accommodate everyone, and it had enough bathrooms for all those girls! The condo was great, plenty of room. My guest had a great time. I hope to book it again for Fantasy Fest next year 2016. Office administration upon checkin was awesome and very helpful...couldn't of asked for better assistance. Request for maintenance was prompt. Perfect for a family vacation. Nice place all around. Water pressure need improvement plus master bathroom needs better lighting and the sliding door need minor maintenance. My family and I stayed in St.Croix Penthouse it was clean and very spacious, the waterfront view from balcony was awesome, the rooms were nice size, it felt like home away from home. While there we celebrated my husband birthday with a family barbecue by the pool, the kids had a great time as well as adults. I would definitely recommend to anyone looking for a rental in Key West. We were 8 adult friends staying in the penthouse, while there to support our friend running the Keys 100 ultra marathon. Although the building and some decor was a bit dated, everyone in our group thought the place was fantastic and filled more than all our needs! Tom B from Clarkston, MI does not recommend this vacation rental. Good location, great view. Penthouse needs a little TLC. Couch needs to be replaced. Staff was accommodating. Rental was great. It accomodated the requested number of guests. We had ample dockage for our boat. Our bait survived ok. The facilities were good such as ice machine, pool, bar and cleaning station. AC worked well and kitchen was good size to cook if we wanted. Spacious, Well Lit & Lots of Fun!! My wife and I stayed here for my birthday with a few other couples. The accommodations were as represented. The unit was clean comfortable. Mostly it was spacious with each bedroom having its own bath. The views from the 2 balconies was fantastic. Very convenient to the marina for fishing charters, etc. Not so convenient to Duval St and cabs charge $4.50 pp in KW. Office staff was helpful but not super friendly. (I submitted a more extensive review earlier - do not know what happened) This was an excellent place to stay. We had a large group and everyone gave this Penthouse great compliments. Property was clean, well maintained, got fresh towels daily, Needed very little contact with manager, however she was always friendly, competent and handled any request promptly. Key West was awesome! We had a day boating with Fury Adventures, saw Dolphins, snorkeled, canoed and had a great time. This Penthouse was very economical for our group of 12. We really loved our vacation stay. This was a multi person birthday celebration and many of us had never been to Key West before. The property was AMAZING and made us feel right at home! It was a bit of a walk to Duval and other places, but the walk was so beautiful there that it was easy. Parking was great, and you couldn't hear any neighbors. The views from the condo were wonderful! As the best man it was up to me to put together my buds bachelor party, and could think of no place better than Key west in March. Looked into many other vacation rentals and hotels and could find no better value. What we got was more than we could asked for. A truly silly 4 bedroom 4 bath penthouse suite. Balconies everywhere with doors that open up half the place to outdoors. Cool lil pool and tiki hut with grills. Slightly over a mile walk to Duvall, walked a couple and cabed it a couple. Not very grand but very nice. We had 7 guys more than enough room. Had a time of my life never forget pelicans landing. Ps charter fishing Capt. picked us up at our dock how do you beat that. Lots of space. Easily sleeps 12 people. 25 min walk to Duval St. Two great balcony areas. Location was more than 5 blocks from Duvall Street. Quite a long walk. Very satisfied with facilities and made family vacation very enjoyable. Seafood festival right across the street was an unexpected treat! Hello Fran, Glad you enjoyed your stay. Hope to have you and your family stay with us again. We were not vacationing; we were working and the accommodations were very good for us. We wish we had more time to enjoy it. Thanks for being so accommodating and helpful! Tammy is great to work with and the maintenance guy that fixed our bathroom was very quick, professional and did a great job! The keys that one guy took off with are on there way back. Thanks again! The staff was very helpful. The room was clean and was in great condition. We had a great time. I would definitely stay here again. I stayed at this condo for mini-season 2013. The place includes a boat slip which is exactly what we were looking for. You can tell that the place hasn't been updated in a while. The furniture and tv look like something out of mid 1990s. With that in mind it was clean and had a well stocked kitchen. We ran into a few issues with a fan and an AC unit but they were fixed quickly by the staff and everyone was very nice. The location is a short bike ride from Duval but then again just about everything in Key West is. On the whole we enjoyed our stay but at $4000 for a week the room is a bit pricey. If you don't need a boat slip then I would def look somewhere else. Had a very nice time everyone was so helpful and the place was super clean. Would definately go back. In Key West for my Sons wedding. The unit slept 10 family members very comfortable without using the fold out sofa sleepers. Unit Needs some updating but all of us were happy with the condo. Best to have transportation due to the distance from Duvall (more than a mile), next time we will rent or bring our bikes, to far to walk, especially at night. Overall we were satisfied for what we paid for. Property needs some attention. Various places where the walls and balcony floors were buckling. Hopefully was just the surface and not structural. Room could use updating. Most rooms had old tube televisions with only a very small flat panel in the master. Also old appliances. Good space with balconies facing in 2 directions. Lots of natural light throughout the day. The place was great, we had the 12 person unit on the top floor. The top floor units have a balcony on both sides of the condo (harbor and island view) great! Unit was reasonably clean, girls thought it needed a little better cleaning. Fridge was old, but worked fine. Unit had alot of room. Boat slip worked out great, rented from Spencer boat yard within walking distance. Pool was very cold in the middle of March, did not feel heated. Great place, great location, would do it again in a heart-beat! The only drawback was a couple of very loud parties but they mostly eventually controlled themselves and I realize that the rental company tries to go out of its way to ID these, so just life. 7 of us stayed at this location for 6 days. it was great. not too far from the action but far enough. we will be staying there again next time in Key West. The whole family had a great time and the condo was perfect for all of us to enjoy the island. Harbor view was nice and the sunsets were always enjoyed. Thanks for the wonderful services you offered us. Very clean condo. Very nice and spacious. Great views. Will definitely stay here again. Hello Jeremy, Glad you enjoyed your stay, hope to see you and your family again soon. We were very please with the accomodations, a new refrigerator would be a good investment. The size of condo was great. The beds were comfortable & seemed new. Baths could use a little updating of stained grout. A new sofa, coffee table, area rug, lamps would really make this condo look cleaner. Needed more silverware. Overall good value. Just needed a little TLC. We rented this condo for some chillin' family time when my son returned for his deployment in the Marine Corps. We rented the suite that slept 12 and when we arrived, were surprised at how spacious all the rooms were. Great location! We will definitely be back. I was very happy with everything. My guests from Spain loved it! The Condo was great with 4 bedrooms and 4 baths and a beautiful view of the water. It was great for a large family wedding party. Unfortunately, the location is across from a public safety facility and firestation so sirens keep you up all night. And due to Spring Break we had lots of party goers and some that even slept by the pool at night. Also, we tried to use the grills one night and there was no gas for any of the grills. The elevator broke on our next to the last day but it was fixed before we left. Alex was very nice to work with during the reservation process. This 4 bedroom/4 bath condo was great for 8 people. Very large interior with a very large balcony overlooking the inlet. About a 30 minute walk to the southernmost point and most of the bars, but very quiet in the area around the condo complex. We were very please with the 2 units we rented. The items that were not working when we arrived were fixed promptly. It was a very large condo and perfect for our long weekend bachelorette party. It had all the ammenities, just a little out-dated. It was a very pretty location on the water and we were on the top floor so from our large balconies we could see everything! The company was very easy to work with, which was helpful with such a large group. We had a great time in the Keys. The location was perfect, the condo was spacious and clean. We could not have choosen a better place to stay! Great location. The unit was clean and spacious. The elevator was out of order for the duration of our stay and I was really disappointed the management didn't offer anything for that inconvenience. Wonderful Vacation site for our family reunion. The Retreat facility was wonderful. My family was well pleased from the first moment we walked into the condo. The St. Croix Retreat met our needs perfectly. Thanks for being a part of a very memorable vacation. Really big condo. Plenty of space for 12 and more. The place was pretty clean. The walk to Duval is pretty far, but cabs are not that expensive. Convenient spot to fish from. Overall we enjoyed our stay. The rooms and the balconies were great. The property manager failed to mention that the washing machine was broken so when we attempted to use it, it flooded the entire kitchen. But the manager was very helpful over the phone and brought us new towels. The stuff found in the kitchen could have been cleaner and less used but otherwise we all loved it!